Missy Yarbrough’s second-graders were studying waves. They sat on the carpet in their classroom at Carroll-Oakland Elementary School in Lebanon, Tennessee, watching Yarbrough at the SMART board in front. Minutes later, they popped up and separated into three groups. One group of students plopped down at desks with laptops and headphones. Another settled in at a table with worksheets. The third group headed to the back of the room, where an intriguing set up of empty plastic bottles, cooking oil, and water pitchers awaited them. Yarbrough helped the students measure out the correct proportion of water and oil into the bottles. Shaking the bottles, the students watched as the oil separated from the water and rolled back and forth, showing in miniature how waves are formed. Yarbrough’s experiments and the lessons did not come from a textbook. The Tennessee Digital Resources Library (TDLR) is a curation of free, high-quality digital materials that teachers can use in their classrooms and students can use to do homework and is aligned with state standards. 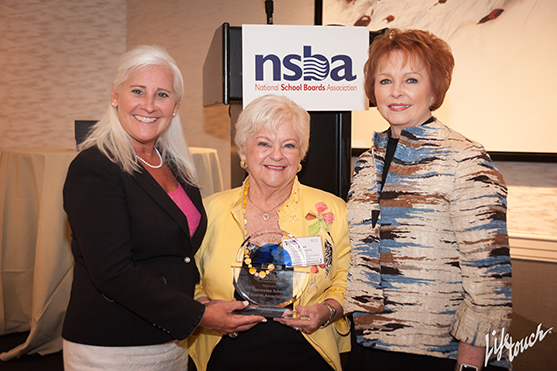 The Tennessee School Boards Association (TSBA) was instrumental in creating the TDLR, which earned it the Leading Edge Award from the National School Boards Association. Grissom and her board reached out to their state education partners: the Tennessee Education Technology Association (TETA), the Tennessee Organization of School Superintendents (TOSS), and the Tennessee Association of Supervision Curriculum and Development (TASCD). TSBA hosted 58 teachers from across the state at its office in Nashville for a two-day Apple-led workshop to learn how to find high-quality digital resources. That cadre of teachers then spent weeks finding digital resources. High school came first, and the teachers who specialized in those courses helped curate the resources for those topics. Other partners offered support, as well. American Public Education Foundation, headed by former NSBA and TSBA President David Pickler, provided stipends and an iPad each teacher. “When Dr. Grissom contacted me with this amazing idea about the Tennessee digital resources library, I immediately saw the tremendous potential that her vision had,” says Pickler. “This was an opportunity to really make the students of Tennessee future ready and make sure that we could really bring the benefits of technology in the 21st century into the classroom all across Tennessee, rid classrooms of obsolete textbooks, available and have the resources of the internet and all the amazing curricula and content that's out there, but do it in a manner that really allows teachers to be able to access vetted, quality curriculum that’s aligned with the standards of the state of Tennessee. Former Tennessee state senator Jim Tracy sponsored a senate joint resolution in support of the TDLR. The Tennessee Book Company became involved when the original plan of uploading the resources to iTunes became unwieldy. The TDLR is now housed on the company’s platform Thrivist. It was important to everyone involved in curation that they were vetted by state teachers and they align with state standards. The Tennessee Department of Education was consulted, as well. The TDLR allows teachers to find content that matches the standards they are teaching on any given day. They can also find resources for their students, according to Joan Gray, the executive director of TETA. Wilson County Schools, a fast-growing district east of Nashville, developed with its teachers a curriculum called Wilson Core, which is aligned with state standards and includes digital resources that aligned as well. The district makes its resources accessible through the TDLR. It’s important that the district – one of the wealthiest in the state – can share resources across the state, says Superintendent Donna Wright. “It’s something that’s become a mission and a passion of ours” that the district’s digital content is available to other districts that don’t have the same resources.